Wow--it would be so great to work from home! If you are a work-at-home mom or dad, you have probably heard those words too many times to count from work-outside-the-home parents. Perhaps that awe-struck parent had visions of days in pajama pants or delusions of a spotless home and daily, farmer's market style, home-cooked meals and elaborate, after school craft projects. Hmm. Perhaps you gave that parent a slight smile or, maybe even a distant nod--but, inside, the, "Umm..No, not really so great." thought crossed your mind. While it may seem easier for parents working from home to create that, all-important, "perfect-world" for the family and work-life balance--that's simply not always the case. 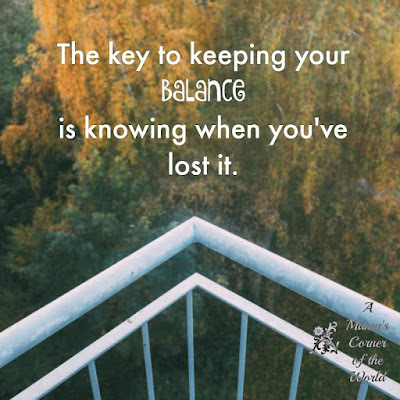 If feelings of stress, guilt, exhaustion, and failure are constantly lurking in the back of your work-at-home-parent-mind; we have a few tips for finding that elusive work-home-family-self balance for work at home moms and dads. If you have lost your sense of "balance"--it's okay. You really can get it back! 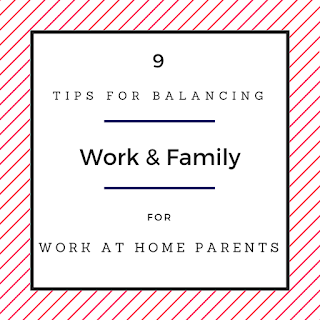 What are some tips for balancing work and family as a work at home parent? Stick to a Schedule that Works for YOU. The key to sticking to a work at home schedule is making a schedule that works for you. This may not be a traditional 9-5 or 7-3 sort of schedule. This may not be the same schedule as any WAHP (Work at Home Parent) that you know! And that is okay! My typical day runs roughly like this: I work from 4:30 to 6 am. Then I get the family off onto their days--packing lunches, making breakfasts, driving my kids and other people's kids here and there, etc. Then, I go back to "work" from 9am to 1 or 2 pm--depending on my day's tasks. Then, I switch gears to tackle the day's home duties (dinner, housework, yard work, grocery store, errands, etc.) The girls come home from school by 4 and it's time for after school activities, homework--and parenting. Some evenings, I work again between 6-8 pm, some days it's 7-9pm, and some days I'm simply finished with "work" at 2 pm. Make a schedule that works for you, your family, and your personal life path. Then--stick to that schedule as closely as possible. Every. Day. Accept Help. Working from home does not mean that you have to work 24-7. Really. And that is the failure driven trap that many WAHP's fall into. It's okay to accept a little help. Whether your spouse picks the kids up from an activity or two during the week--or you join a carpool with a group of parents to get the kids from point A to B to C--or you assign (a lot of) daily household chores to everyone in the house--it's okay to step back and accept some help. You don't have to do everything for everyone because you are at "home" all day. It's easy for the family to forget that you are actually working (just like an "outside the home" working parent) during most of those at-home hours! Get Organized--and STAY Organized. 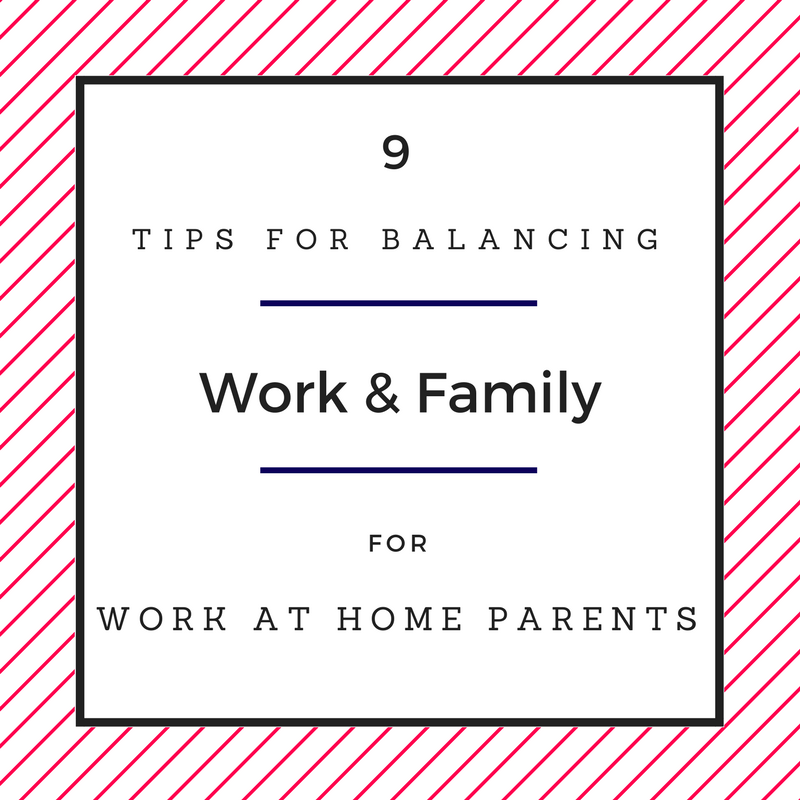 Balancing work and life just isn't a simple task--even if you are home most of the day. It requires planning. A lot of planning. Organization is truly the one thing that keeps my life (mostly) balanced. From meticulous calendars to planned meals and family schedules and detailed, daily chore lists--for everyone--getting organized and staying organized help me move from role to role during the day quickly and easily. The tasks of your day do not simply fall into place--you have to put them into place--and keep them in place! EVERY DAY. Remember that No is NOT a 4-Letter Word. I wrote an entire article about this back in the day when I wrote the Columbus Stay At Home Mom Examiner column. No is not a dirty word in the mom-vocab. It's really not. Work at home parents have flexibility in scheduling--sure--BUT, they are not free and available all day every day for each and every need that arises from everyone everywhere. Realistically. No. Period. You do not need to volunteer for every committee and extra activity happening every day with your child's school or sports team. It is okay to say no. In fact, you need to say no and set priorities in order to be a successful. work at home parent. Your kids will survive. Really. If something fits your work schedule and your interests--do it. If it doesn't fit both--say no. I volunteer for 1-2 "big things" per school year--Last year, I coached a Lego Robotics team (we met once a week for 8 weeks after school for 2-3 hours and had one all-day competition on a Saturday) and I served as a soccer team parent for a season (I created a snack schedule on a fully automated volunteer signup website--and organized trophy orders and the end of the season party at a local spot I've used for years for such events!). Along with those two Big Things; I accept only 1-2 "small things" per month-like baking cookies for a bake sale or volunteering for one school dance or event, or hosting an after-school group project session--or group carpool to/from an activity or two . Everything else that crosses my path is "declined". Forget the Guilt. While I do volunteer my time; there is still a little guilt at times--like when I've committed to my "big thing" for one child during a semester--and child 2 comes in a few weeks later and wants a commitment for a second big thing during that same time frame--and I have to refuse. I will admit it...sometimes...I break my rules and agree--if the opportunity is ultra-important to both child & parent alike--with the understanding that second semester may get nothing BIG from me...for either child. Or...we face a small thing challenge when the girls' dance studio needs volunteers for an event during a month when I've already committed to my maximum number of "small things" for school or sports teams. I do feel a little guilty-- in every situation--but, I force myself to shake it off. Because--my contributions throughout the girls' activities and events really do balance out over the course of the year without me losing my sanity...my family time..or my job--or blowing my "financial contribution budget"! Create Separate To-Do Lists for your Various Life Roles. I maintain a weekly work list, a home list, and a self/family to-do list--and feed these lists from a giant master list of activities that I jot down as needs pop up throughout each day. (Things like schedule an oil change, drop off dry cleaning, hit the salon, pay athletic fees, schedule a vet appointment, drop off clothing donations to a charity, etc.) My work list contains deadlines, meetings, projects, etc. My home list contains home maintenance activities like scheduling repairs or paying bills. My self and family list contains appointments, activities and individual items needed by myself and family and includes everything from haircuts to special homework project needs to birthday party planning. Keeping these lists separate helps me make sure that I am not forgetting anything (or anyone) important--and helps me prioritize my various "hats" and roles during my scheduled daily time slots. Prioritize Every Day. I use a dry-erase, white board to write down each day's priorities in each of my work-at-home mom roles. For example, today, for work, I have two blog posts to write, photos to edit for a travel article, 9 social media activities to plan and execute, and a client project to coordinate. On the home front, I need to finish laundry & tell the washing machine to self-clean, change cat litter, pay bills, and do a quick batch cooking for a handful of the week's meals--along with some usual day to day activities like bed making and vacuuming. For the family, I have some tasks to complete from a recent birthday party like thank you cards and photo work for a blog post; high school academy selection for my 8th grader, eye appointments to schedule, dance class bags to pack, dinners to make and pack (since we are eating on the go tonight), and violin lessons to schedule. While there are many other tasks that I would love to do today--these "priority" white board tasks are my focus. These tasks must be done before the day's end. If I accomplish anything else from my separate to-do lists--great. If not--those items may hit the "priority list" tomorrow..or the next day! Schedule your Quitting Times. Every Day. My schedule is my own. And a little scattered! I wake up at 4 am to begin my day. I quit work between 6 and 9 am. For a while. Every morning. This lets me focus on family time and breakfast and on getting everyone off onto their days. Then I go back to work. I quit work at scheduled times every afternoon to manage my home and family. I quit work at specific times every evening to allow for homework time, time to talk about the days' events, and time for family time. I quit work completely, every day, no matter what, by 9 pm. I quit work on Fridays at 4 pm. Every week. As a travel writer and blogger, I may do some work on the weekends for projects--but, I typically ignore texts and emails from 4 pm on Friday through Sunday morning (I often work from 4 am to 7 or 8 am...on Sundays--depending on when the family gets up and moving that morning!) --and then, I quit work again from 9 am on Sunday through 10 am on Monday morning. It is just as important that work at home parents schedule quitting times as it is to schedule working times! Breathe..Because There will be days when LIFE Happens. Kids get sick. You get sick. Toilets randomly spring leaks and flood the downstairs....or the upstairs and THEN the downstairs. Cars have flat tires or a dead batteries...or BOTH..or someone breaks into your car and your morning is consumed with a police report and an insurance claim filing. Perfect plans and schedules sometimes fall apart. BUT--there are some things that you can do to minimize the impact of those "life happens" days with some balance during every other moment possible! My tips work for me. Hopefully, you can make them work for you in your corner of the world too. When I just gave birth to my first child, I thought about becoming a housewife and spending all my free time taking care of my child. But after I had been at home for about a month, I realized that I would go crazy if I really spent all my time on it. It’s difficult to work and raise a child, but I was lucky because I found essay shark and they can now free up some time for me to spend with children. If I need to write a report or similar documents, they literally save my life.